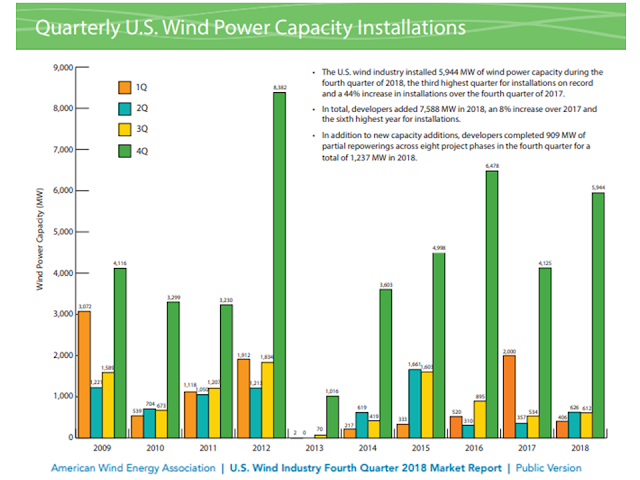 The U.S. wind industry installed 5,944 megawatts (MW) in the fourth quarter of 2018, the third highest quarter on record for new installations. 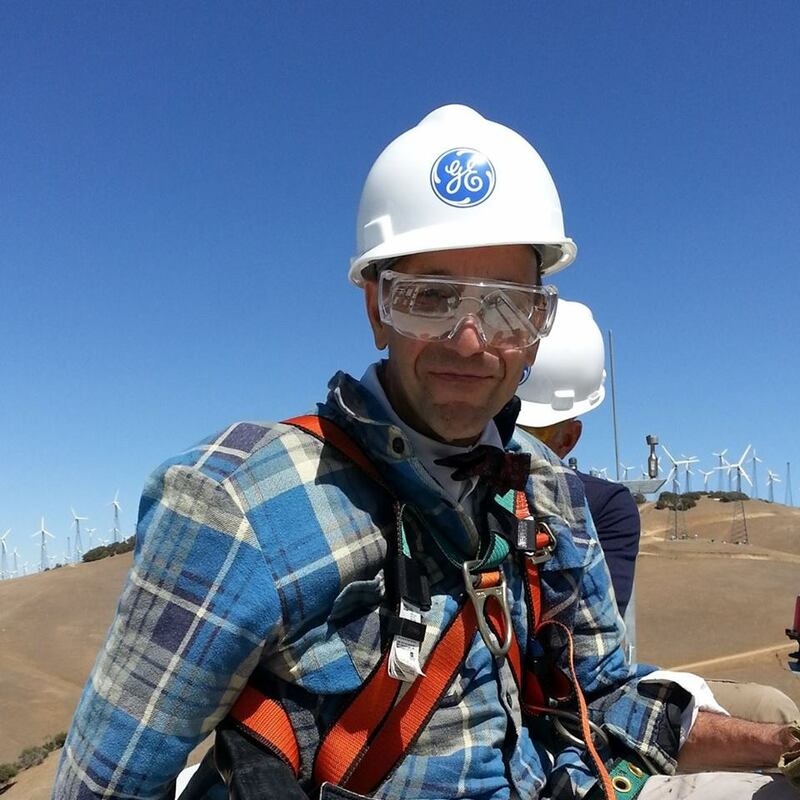 Wind developers added 7,588 MW for the year, bringing total U.S. installed capacity to 96,488 MW. 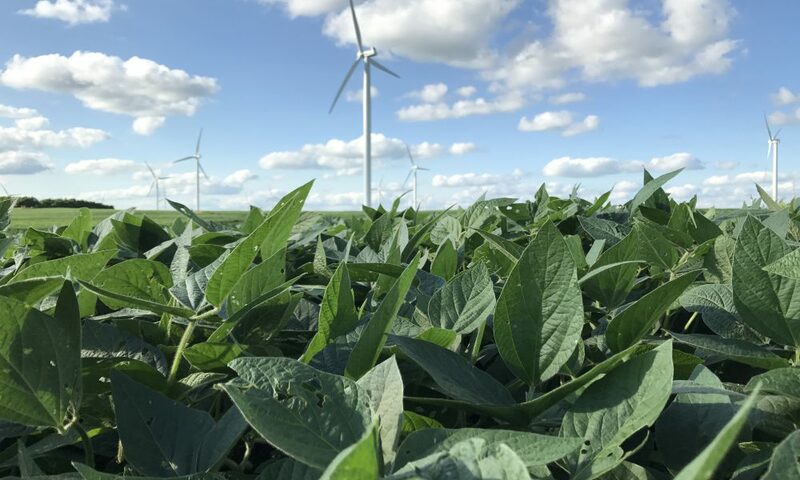 Corporate and non-utility wind procurement set a new record in 2018 with a total of 4,203 MW signed, a 66% increase over the previous record set in 2015. Total PPA volumes reached 8,507 MW in 2018, the highest level on record. This includes 1,589 MW of PPAs signed in the fourth quarter. 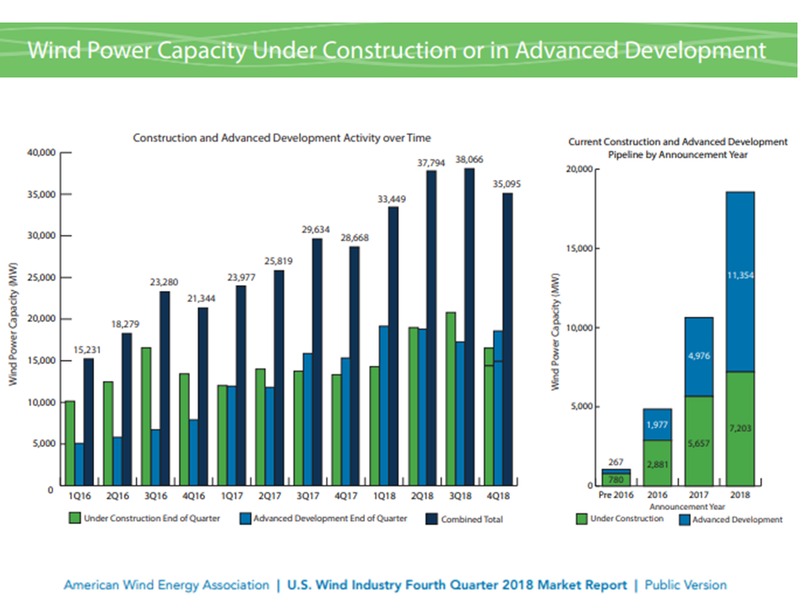 Project developers reported a combined 35,095 MW of wind capacity under construction or in advanced development as of the end of the fourth quarter, with 5,786 MW in new activity during the last three months. 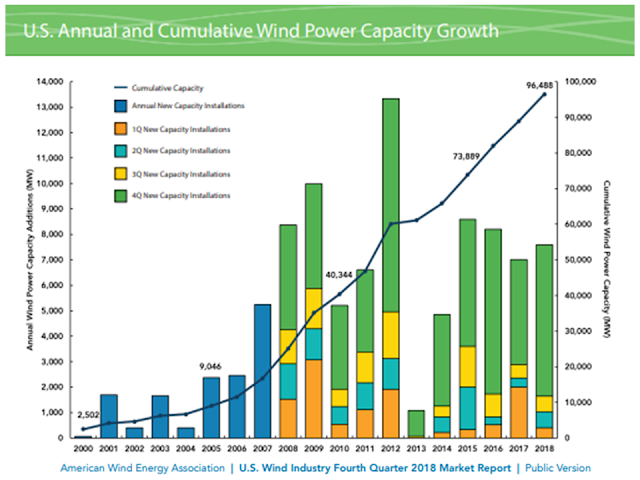 • The U.S. wind industry installed 5,944 MW of new wind power capacity in the fourth quarter of 2018, the third-strongest quarter for installations on record. In total, the industry commissioned 7,588 MW of wind power capacity in 2018, an 8% increase over 2017. 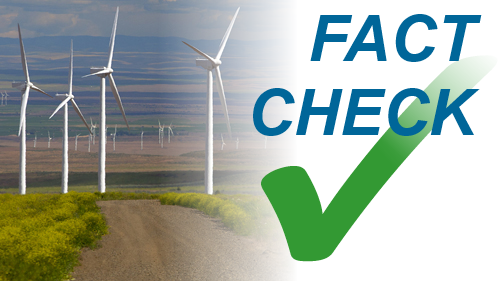 • A total of 47 new wind projects were commissioned across 17 states during the fourth quarter. 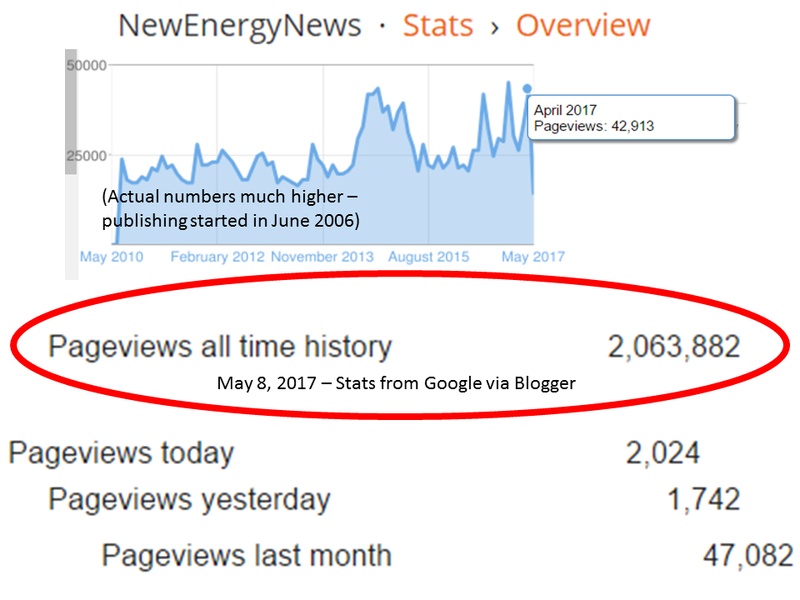 Texas led with 1,479 MW installed, followed by Iowa (1,116 MW), Colorado (600 MW), Kansas (543 MW), and Nebraska (521 MW). • In addition to new capacity additions, developers completed 909 MW of partial repowerings in the fourth quarter. For the year, developers completed 1,237 MW of partial repowerings and 107 MW of full repowerings. • There are now 96,488 MW of cumulative installed wind capacity in the United States, with more than 56,800 wind turbines operating in 41 states plus Guam and Puerto Rico. • At the end of 2018 there were 16,521 MW of wind capacity under construction and 18,574 MW in advanced development. The combined 35,095 MW is a decline from the recent high in the third quarter due to the large volume of projects entering commercial operation, but still represents a 22% year-over-year increase. • Projects totaling 2,379 MW started construction and a further 3,419 MW entered advanced development during the fourth quarter, for a combined 5,786 MW in new announcements. • Texas currently hosts 20% of combined activity, followed by Wyoming (13%), Iowa (9%), South Dakota (6%), and New Mexico (6%). • Project developers announced 1,589 MW of new PPAs in the fourth quarter, bringing total 2018 activity to 8,507 MW. 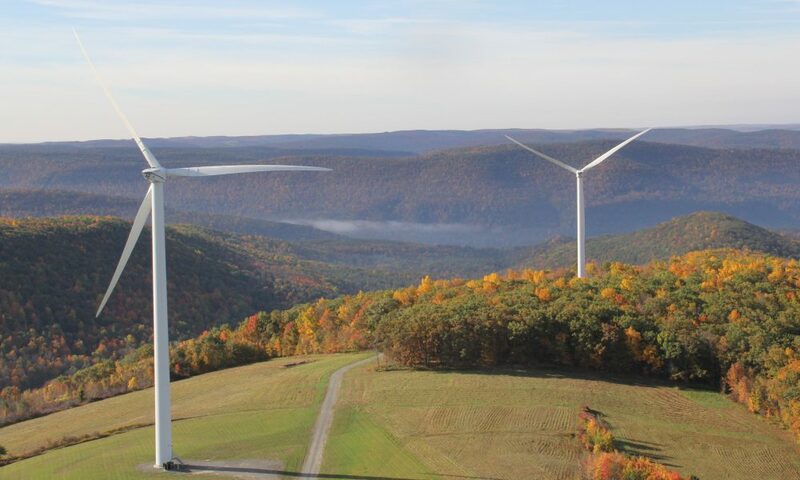 This marks the highest volume of wind PPAs on record. • Corporate and other non-utility customers signed 75% (1,177 MW) of capacity contracted in the fourth quarter, including 7 first time wind buyers. 2018 was the most active year for corporate and non-utility PPAs with a total of 4,203 MW signed, a 66% increase over the previous record set in 2015. • Utilities signed 412 MW of PPAs and announced plans to develop and own 697 MW of rate-based wind capacity during the fourth quarter. 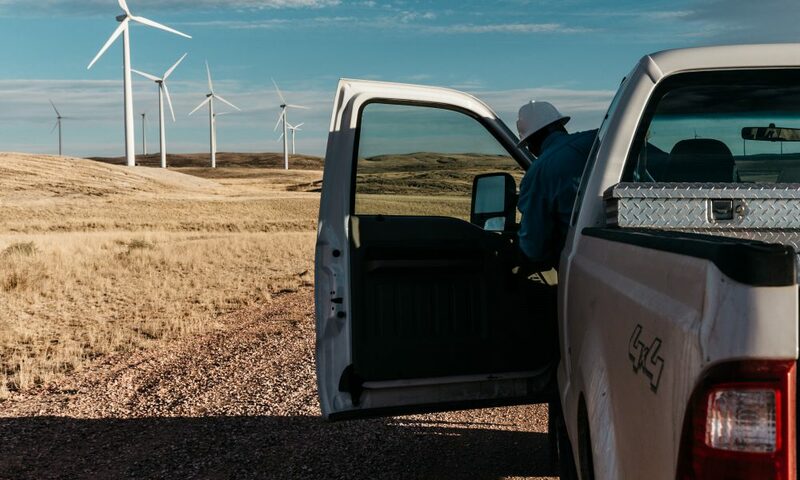 In total, utilities signed contracts for 4,304 MW of wind capacity and announced plans to add 3,111 MW under direct ownership throughout 2018. • GE Renewable Energy reclaimed the top spot for turbine manufacturers in 2018, capturing 40% of U.S. wind turbine capacity installations. Vestas followed with 38% of the market, Nordex USA captured 11%, and Siemens Gamesa Renewable Energy represented 8% of installations. • The majority of turbines commissioned in 2018 have a nameplate capacity between 2 MW and 3 MW, while 24% of projects are using turbines rated 3 MW and above. • The U.S. wind industry installed 5,944 MW of wind power capacity during the fourth quarter of 2018, the third highest quarter for installations on record and a 44% increase in installations over the fourth quarter of 2017. • In total, developers added 7,588 MW in 2018, an 8% increase over 2017 and the sixth highest year for installations. • In addition to new capacity additions, developers completed 909 MW of partial repowerings across eight project phases in the fourth quarter for a total of 1,237 MW in 2018. • Developers commissioned 47 new wind project phases totaling 5,944 MW across 17 states during the fourth quarter. • Texas led in fourth quarter installations with 1,479 MW, followed by Iowa (1,116 MW), Colorado (600 MW), Kansas (543 MW), and Nebraska (521 MW). • A total of 20 states added wind capacity in 2018. Texas, Iowa, Colorado, Oklahoma, and Nebraska led in installations for the year, each adding over 500 MW. 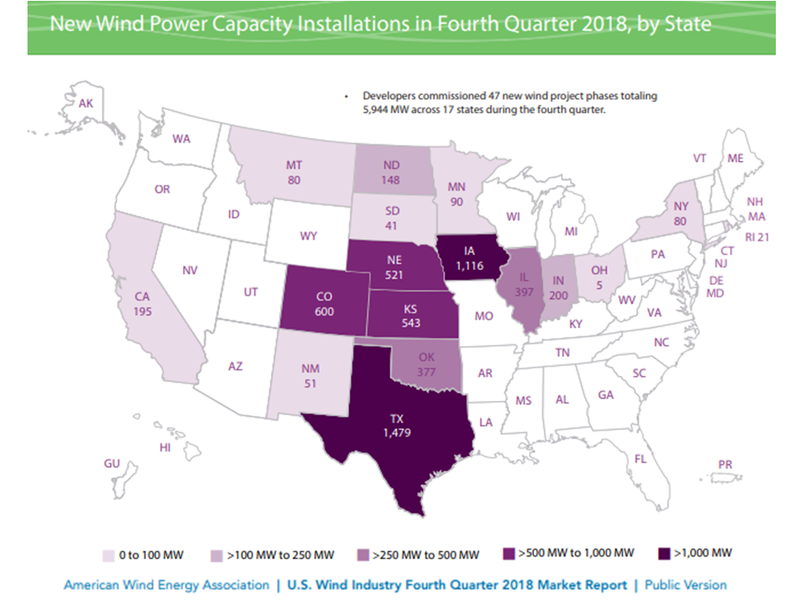 • Iowa surpassed Oklahoma in the fourth quarter to reclaim the second spot for cumulative installations. Texas continues to lead the nation with 24,899 MW of cumulative installed capacity. 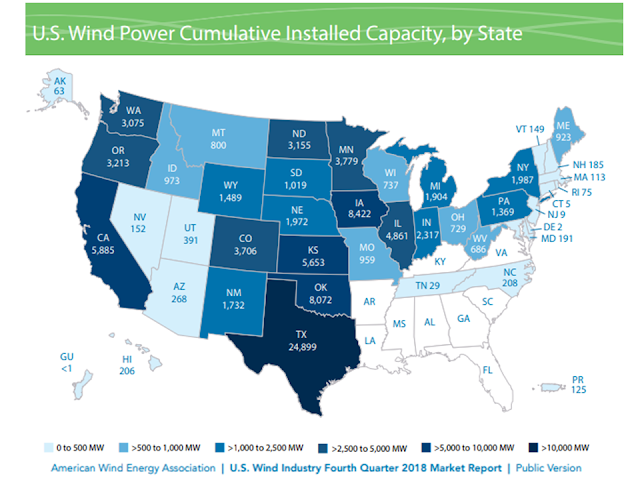 • Iowa and Oklahoma became the second and third states to exceed 8,000 MW of installed wind capacity, while South Dakota became the 19th state to surpass 1,000 MW. At the end of 2018 there were 35,095 MW of wind power capacity either under construction (16,521 MW) or in advanced development (18,574 MW). Combined activity decreased quarter over quarter due to the large volume of projects commissioned in the fourth quarter, but still represents a 22% year-over-year increase. • Project developers announced 5,786 MW in combined new activity during the fourth quarter of 2018, with projects totaling 2,125 MW starting construction and 3,661 MW entering the advanced development phase. New announcements were up 26% over the previous quarter. • Wind projects currently under construction have been underway for an average of three quarters, while projects in advanced development have been underway for an average of one year. 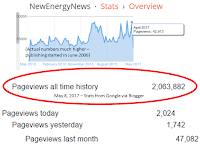 Over 50% of the 35,095 MW underway started construction or entered advanced development in 2018. 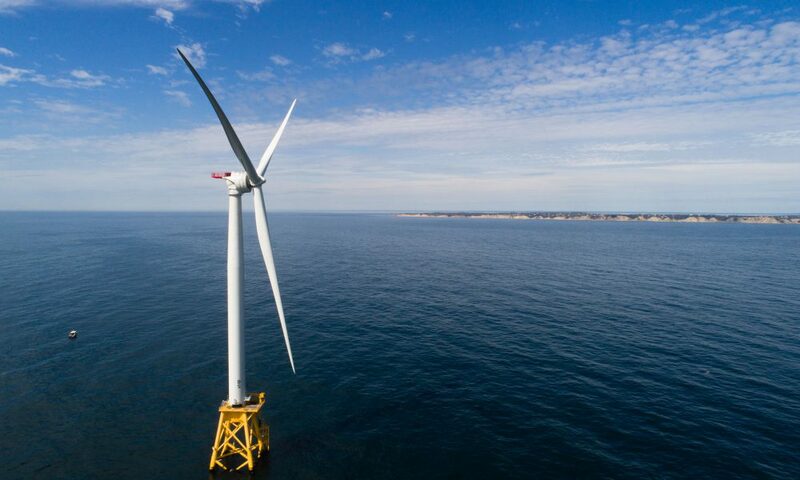 • Developers reported 16,521 MW of wind capacity under construction at the end of 2018, with projects totaling 2,125 MW starting construction in the fourth quarter. • On average, project developers started construction on 2,748 MW of wind capacity per quarter in 2018.